In 1482 Mary, the last Duchess of Burgundy, lies on her deathbed in a castle in Flanders. She is only 25. In her final moments she makes a wish that, 500 years later, will threaten the lives of a boy and a girl living in Brussels. 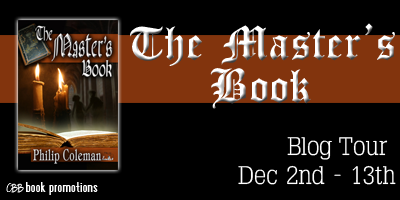 The Master’s Book is the story of Sean, an Irish teenager, just arrived in Brussels to a house that is also a crime scene. 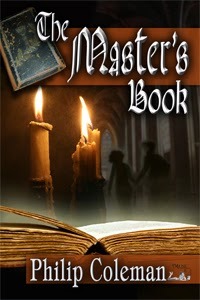 Together with Stephanie, his classmate, he finds an illuminated manuscript, only for it to be stolen almost at once. My usual genre of choice is scifi/fantasy, so I'm always on the lookout for books in other genres that I can recommend to my students. 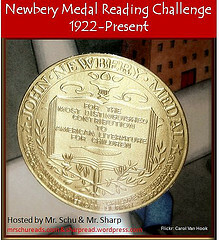 When I heard about this mystery that would fit with my students, I was excited to give it a try. I was sucked into the mystery, and all of the adventurous dashing about to figure it out. There were so many things I enjoyed about the story and characters. I loved the setting, and the interesting phrases and vocabulary my students could learn along the way. I have to admit to mostly being thrilled to read a lot of Irish references, since I visited Ireland on my dream trip this past summer. In spite of my fascination with magic and science fiction, I am also a huge fan of history. The illuminated manuscripts I saw while visiting Trinity College in Dublin this summer took my breath away. So when I dove into the story and started to learn about Mary of Burgundy and her Book of Hours, I was well and truly hooked. The only thing that niggled at me a bit was the repeated references the main character made to being worried about being seen as "geeky", and his dad's comments to Stephanie about how she didn't need to pretend to like "that stuff". I'm a lifelong geek, and I work hard to make sure my own students can acknowledge, accept, and celebrate their own geeky sides. Still, this only popped up a little bit, so it didn't ruin the reading experience for me. Overall, this is a tale that will interest students in middle school while still being appropriate for strong readers in upper elementary. Maria: I love the sound of Irish, but I’m terrible at pronouncing it myself. Do you speak Irish? How do you feel about the decline of the Irish language? Can you give us a clue how to pronounce Sean’s family’s names with a true Irish lilt? Philip: Yes I do speak Irish, though not as well as I would like, and my written Irish is a mess. I feel sad about the decline of the language, which I think has impoverished us as a country. I guess it has probably bottomed out now, in that there are still pockets of native speakers in the west and Irish-speaking schools are becoming ever more popular. I deliberately chose names that, although Irish, would be familiar to international readers and that are easy to pronounce: Sean (Shaun), Maeve (Maiv, though the authentic spelling is Medb), Fintan (self-explanatory). The hardest to capture exactly is Catriona, the mother, which would be something like "Cotch REE uh na). Maria: As an American; I know we are often criticised for our inability to speak multiple languages. What languages do you speak fluently? What is your opinion on the importance of children learning to speak other languages? Philip: I speak French adequately and can understand some Spanish, Italian and German. Understanding other languages, is key to understanding other cultures. You quickly learn a lot about the importance different cultures attach to different things, in that one might lack a word for one thing but have several words for something where English speakers have one. One of the reasons why I moved to Brussels was for my children to learn other languages - French and, in my Son's case, also German. This improved their ability at Gaelic too, which they kept up in the European school. Maria: Sharing hot drinks is an important part of many cultures, but seems to be even more so in Europe. Do you have any particular favorites? Philip: Strong Irish tea (builder's tea, we call it) and good coffee are my favourites. I also like hot chcolate but the quality you get in cafés is very variable; coffee is the most reliable drink. Maria: I loved the hidden doorways and secret rooms. Did you have any specific inspiration for these parts in the book? Philip: Not especially; I just wanted to draw out the mystery so I kept adding one obstacle after another to the children finding the book. Of course it's standard in Belgium for houses to have basements, something that is much less common in Ireland. 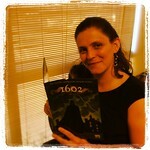 Maria: Art is an important part of the story, and I loved the fact that Maeve researches Hieronymus Bosch. Who is your favorite artist, or what is your favorite artistic style? Philip: Again, I have so many favourites. I do indeed admire Bosch, as well as El Greco, Michelangelo, Bernini, Rembrandt, Vermeer, Turner, Renoir, Hopper, Picasso. I suppose I am drawn most to the Renaissance, both the Italian and the Northern. 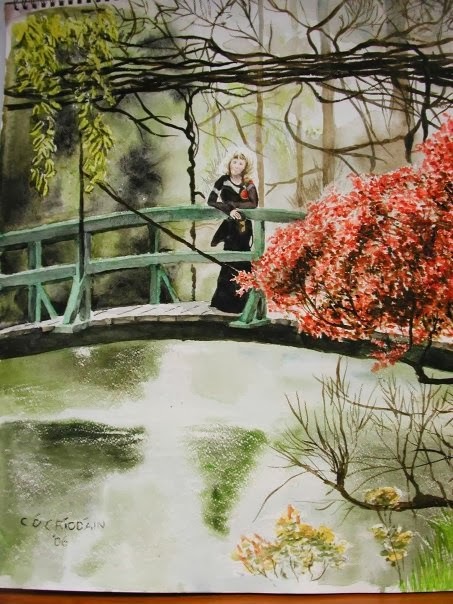 I also dabble a little in painting and drawing myself; here is a painting of my daughter, from when we were living in Brussels, and she is standing on the Japanese Bridge at Monet's garden in Giverny, France. Maria: The beauty of the illuminated Book of Hours is highlighted repeatedly in the story. I enjoyed my visit to Trinity College this past summer, and love medieval artwork. Are there any particular illuminated manuscripts that have inspired you? Philip: Well, growing up in Ireland we were taught all about the Book of Kells and the other Irish illuminated manuscripts from the pre-Viking era. These are much older than the works of the Master of Mary of Burgundy. I suppose what inspired me about him was the fact that we don't even know his name but he produced these beautiful manuscript books. Maria: I found it fascinating that the story about the Nazi looted art being discovered in Munich hit the news while I was reading your book. What do you think should be done with this art? Any other opinions about the story? Philip: It's not straightforward. There may be people or institutions who can prove a claim to at least some of the pieces. If not, they should probably go back to designated museums in the countries of origin of the artists. It's true as well that there isn't an essential moral difference between this theft and the wholesale theft or swindling of artefacts that colonising countries like the UK, France and Germany were engaged in from the 18th century onwards. The Elgin Marbles, in the British Museum in London, and the Pergamon Museum in Berlin, which houses entire buildings removed from the Turkey and the Middle East, are examples. I'm shocked even at how much old European stuff there is in the Met in New York. This is only my second interview for the blog (I had an interview with Ann Aguirre when Outpost came out last year). I worry about making sure I come up with some interesting questions for the author. 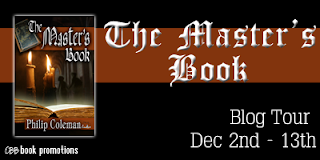 I enjoyed reading The Master's Book and crafting an interview that would be fun for you to read as well!